WELCOME TO BOOKS & BOOKS GRAND CAYMAN! Founded in South Florida by Mitchell Kaplan in 1982, Books & Books expanded their highly respected, independent bookstores to Camana Bay in 2007.Books & Books Grand Cayman is part of the Active Capital Ltd. portfolio of business. The store is located in the Town Centre of Camana Bay, at 45 Market Street, where it is open Monday through Saturday from 10:00am to 7:00pm. The store number is 345.640.2665. Books & Books was one of the first shops to open in the Town Centre of Camana Bay; Grand Cayman's most vibrant shopping and entertainment destination. The store is designed to encourage customers to explore and creates a sense of discovery with a large section dedicated to Caymanian authors, as well as a good number of titles of Caribbean interest. Two light and airy rooms dedicated to children has a particularly impressive selection of picture books in addition to toys, educational games and books for kids of all ages. You can find the latest titles from the New York Times bestsellers list, a large fiction and mystery section as well as a great collection of cooking, travelling and YA books. Books & Books invites infants, toddlers and their parents to join them at Regal Cinemas in Camana Bay (Stadium 6) every Wednesday 10:30am to read exciting new books and sing along to your children’s favorite songs. Young readers 4-7 years-old are invited to join us in the store every Saturday at 10:30am to read exciting new books and explore their creative side with a unique craft each week. Join The Bookends Club when they meet to review their latest pick. Come share your insights and impressions in an open discussion. 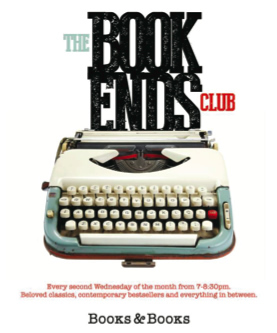 The Bookends Club gathers at Books & Books on the second Wednesday of every month from 7-8:30pm and new members are always welcome. 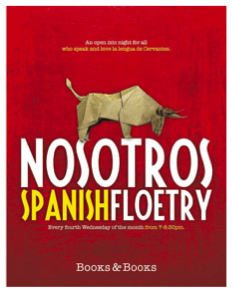 Spanish-speaking poets and performers—and those who simply enjoy la lengua de Cervantes—are invited to join Nosotros, a group whose mission is to build bridges and create connections through culture, for their monthly open mic night. Nosotros gathers at Books & Books on the fourth Wednesday of every month from 7-8:30pm and all are welcome to attend. For more information, contact Michel Powery at 345.917.0335.
or email us directly at caymanbooks@booksandbooks.com. Like Books & Books (Cayman) on Facebook and follow @BooksandBooksKY on Twitter for event updates, book recommendations, new arrivals, interesting articles, literary quotes and much,much more. If your friends would like to join our email list, let them know how easy it is to sign up at our Website, www.booksandbooks.com. And please forward this email along to them.